In Sub-Saharan Africa, millions of smallholder farmers work plots of land no larger than a few acres. These farmers form the backbone of the rural economy across much of the region, but they often remain trapped in poverty by low yields and low, unstable prices for their crops. Agriculture in the region has been characterized by a persistent gap between potential yields and what smallholders actually achieve on their farms. Farms in much of Africa are also typically far less productive than those in other regions of the world. For example, the Food and Agriculture Organization calculates that maize yields in the United States are six-times greater than those in both East Africa and West Africa. Even farms in other emerging markets, like India, are often 50 percent more productive than those in Africa. Poor training on good agricultural practices: With little exposure to effective agricultural training, farmers learn their vocation from relatives and neighbors. As a result, they rely on often ineffective farming techniques, rather than good agricultural practices that boost yields and preserve their farms. Limited access to high-quality inputs: Fertilizer usage per hectare in Sub-Saharan Africa is just one-eighth that of the United States . Smallholders have a hard time finding agro-input dealers near their farms or vendors who sell inputs in appropriate quantities. Furthermore, farmers living on the margins of profitable rarely have cash to purchase high-quality inputs and are unable to access loans to pay for them. Finally, because farmers are unable to test their soil and receive limited guidance, whatever fertilizer they are able to purchase is often ill-suited for their farms. 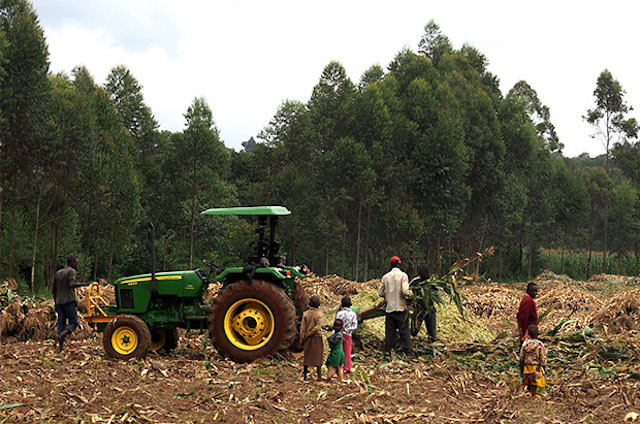 Lack of mechanization and other yield-enhancing technologies: Africa has far fewer tractors per hectare than other regions of the world, and those tractors that are available tend to serve large commercial farmers. Additionally, many of the tractors are in poor condition and are operated ineffectively. In 2013, John Deere and TechnoServe launched the Mobile Training Unit (MTU) project to help farmers in Ghana and Kenya. The project not only provides training through videos and hands-on demonstration, but also strengthens the organizations and linkages that farmers need to prosper and—increasingly—helps these farmers to enjoy the benefits of mechanization. Since 2014, the project has benefitted 47,194 people, helping them to earn an extra $29.9 million of income. When the MTU project launched with support from the John Deere Foundation, its focus was on helping farmers raise their crop yields and earn better prices through capacity building. The project has worked to improve the techniques farmers use to grow, harvest, and store their crops; improve the management of organizations that aggregate crops, negotiate sales, and provide services to farmers; and build linkages with the lenders and processors who are vital to agricultural value chains. As the MTU and demonstration plot projects created closer linkages to mechanization and John Deere’s business, the funding shifted from the Foundation to Corporate Citizenship. In addition, equipment was donated in both countries to supplement the training with local demonstration plots. The MTU project takes its name from the mobile training unit – a box truck modified to screen training videos and host workshops. The MTU has proven to be an effective tool for delivering training to a large number of farmers. The MTU’s mobility makes it easy to reach widely dispersed, rural communities, while the video elements are engaging for farmers, ensuring high attendance. The training sessions are relatively short and women are able to easily attend, even with small children. The MTU visits each community multiple times per year, providing timely training on current production practices and business processes. As a result, the program’s reach vastly exceeded expectations: the first phase of the project had a target to train 10,000 farmers in Kenya and Ghana, but it ultimately trained more than 17,000 farmers. To increase the adoption of good agricultural practices, demonstrations at the MTU sessions are supplemented by hands-on training on agricultural plots. Since 2015, the program has shifted to a model of “lead” or “pioneer” farmers, selected in consultation with farmer business organizations based on their openness to use and promote recommended farming techniques. These lead farmers work with project staff to demonstrate techniques on their own farms. Smallholder farmers often find it advantageous to band together and form farmer business organizations (FBOs). These membership-based enterprises vary greatly in size, with the number of suppliers ranging from dozens to thousands, and have a vital role to play in the agricultural sectors of western Kenya and northern Ghana. They aggregate and market crops from smallholders and provide agricultural extension, credit, and services. In practice, however, the FBOs struggles with organizational management and business administration, often limiting their effectiveness. For that reason, the MTU project worked with 160 existing and new FBOs to improve their capacity to work on behalf of smallholders. The organizations’ leaders received training on group management, budgeting and financial administration, marketing, business-plan development, negotiation, and other vital functions. With improved capacity, these 160 FBOs have worked with the MTU project to better link smallholders to the capital, inputs, services, and markets that they need to prosper. The project has worked to identify processors and mills that can serve as off-takers for the farmers’ crops, offering smallholders a more reliable (and in some cases higher) price than traditional, informal buyers do. Sales contracts also make it easier for FBOs to secure loans. In addition, smallholder farmers are often unable to access yield-enhancing inputs and services because they don’t have credit with which to purchase them. The MTU project has worked with commercial lenders in both Ghana and Kenya to develop financial products that work for smallholders, FBOs, and mechanization service providers, and has strengthened the ability of FBOs to serve as distribution channels for the inputs farmers need to improve their production. In Kenya and Ghana, women play a crucial role in small-scale agriculture, and this is especially true for food crops. Nevertheless, men receive the vast majority of training and financing, and dominate farm management. The MTU project sought to address this situation by ensuring that its activities also reach female farmers and empower women to take a greater decision-making role on the farm. The project therefore scheduled training sessions at times and locations when women are most likely to be able to attend, and – to address traditional beliefs about women’s inability to manage farms, and to provide positive role models – the project has recruited 20 women to serve as lead farmers in Ghana, managing demonstration plots where other women can observe the impact of good agricultural practices. The project has also worked to address the lack of female representation in FBOs, and the training that FBO leaders receive includes lessons about why and how to recruit female members and elevate women to leadership positions. To date, one-third of the project’s beneficiaries have been women. The MTU project has worked with local stakeholders to encourage a model for mechanization in which both demand and supply for the services is sustainable. Project staff identify existing tractor owners and entrepreneurial farmers who can become mechanized service providers (MSPs), delivering services to smallholders for pay. These individuals receive training on agricultural techniques and the business skills required to run a small enterprise. To increase the supply of tractors, the project links MSPs to lenders who can finance equipment purchases. The project has also worked with FBOs to build and aggregate demand for mechanization services. Workshops at the MTU and sessions at demonstration plots highlight the impact of properly delivered mechanization services. Minimum tillage and conservation agriculture are important themes, and the trainers emphasize the use of seed drills with Ghana’s rice farmers, as it can dramatically increase yields. Under the model, demand for services from individual smallholders is aggregated by FBOs, creating a more efficient market for MSPs to operate. In the future, FBOs are expected to offer the services on credit to member farmers. Since 2014, the MTU project has helped 47,194 people earn an additional $29.9 million of income. The MTU training methodology has also proven effective in helping farmers to adopt best practices In Ghana, 60 percent of participating farmers were found to have adopted good agricultural practices after participating in the project. In Kenya, an evaluation found that 78 percent of female participants were able to retain what they had learned about good agricultural practices, while 61 percent of their male counterparts were able to do the same. The combination of better know-how, improved access to inputs, and stronger linkages has helped farmers improve their productivity; and the project has also facilitated $2.4 million of new financing.